If yesterday’s post was too straight forward, today’s will be a little more complicated. “Days Of Future Past” brought on the super epic “Days of Future Present” and ties together the X-books of the time with the Fantastic Four. This ran through four annuals (Uncanny x-Men, X-Factor, Fantastic Four and New Mutants) in the summer of 1990. And it all pivots around Franklin Richards. An older, adult Franklin from the alternate future where “Days of Future Past” happened travels back in time to the then-current day Marvel Universe, which causes all kinds of craziness with the Fantastic Four and the young, child Franklin. It also causes problems with Rachel Summers, who was originally from the same timeline as adult Franklin where they were romantically involved with each other and she assumed he was dead. It only gets more confusing as it is revealed that when Rachel traveled back in time, an evil Sentinel/cyborg hybrid called Ahab had followed her, planning on not only killing her but several mutants and super humans who would become in the future. It’s a lot like Terminator 2: Judgement Day, only coming out the summer later. And as this is going on, both Franklins are having trouble controlling their mutant ability to war reality, which makes things all the more difficult. The story is a little long at times, but the writing team of Louise Simonson, Walt Simonson and Chris Claremont manage to make it cohesive enough to be enjoyable. But then again, during this time any book that was associated with the three of them was great. On the art side of things Jackson Guide, Jon Bodganove and Art Adams did a great job. The three of them have unique and timeless styles, and nothing felt out of date save for some of the fashion choices. Main story aside, there are some other cool moments. We are introduced to Gambit for the first time, who debuts helping Storm (who has been turned back into a teenager) break into the X-Mansion. There is also the first time that Jean Grey meets Rachel, her possible daughter from an alternate future. That must have been awkward. Speaking of awkward, we also get scenes (like the one pictured) that have both Cable as an adult and as a child in baby Nathan. That’s possible, since Nathan gets sent to the future to be raised, only to come back as Cable. But at the same time I wonder if that aspect of the character’s life was planned out yet. For my next choice I pick two characters who are completely different from each other but together became one of the best super hero tandems ever. I’m talking about Cypher and Warlock from the New Mutants. At first glance, they aren’t necessarily the most exciting characters. Cypher was a nerdy friend of Kitty Pryde’s and it was eventually revealed that he had a fairly non-threatening mutant power: the ability to comprehend, speak and interpret any form of communication. Warlock is a techno-organic mutant from a far off alien home world. Needless to say, the two wound up as students at the Charles Xavier’s School for Gifted Youngsters and eventually as members of the New Mutants team. The two became inseparable and soon were best friends. Thanks to Cypher sharing his own life’s energy to save Warlock, they even share memories. Needles to say, Warlock had an extremely difficult time dealing with Cypher’s death. The alien robot wound up being killed by Cameron Hodge during the X-Tinction Agenda storyline. Like they say, death in comics is only a relative condition and a hybrid Warlock/Dough Ramsey (Cypher’s civilian identity) showed up called Douglock. This reincarnated character looked like a techno-organic recreation of Cypher, but had both character’s memories. Eventually it was revealed that Douglock was really just Warlock having rebooted himself from Doug’s memories. Once Warlock was aware of that, he deactivated the copy of his fallen friend’s memories. Eventually Cypher was resurrected and Warlock (along with the rest of the now adult New Mutants) was able to break him from the evil Selene’s control. Warlock and Cypher are just two great characters because of their friendship. The fact that we’ve been reading it about it for almost thirty years only adds to its awesomeness. I think that says everything you need to know about why I like Boomer.She is definitely a tough cookie. Over the years she’s grown into quite the formidable character. 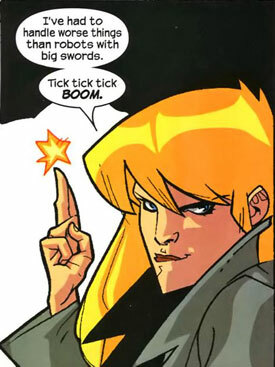 Oh yeah, and her power is infinitely cooler than Jubilee’s. Rob Liefeld’s cover of New Mutants #99 is a homage to X-Men #138.As that much earlier issue was about changes, this issue serves as the beginning of the transition period from the New Mutants to X-Force. It’s been a rough few months for the New Mutants, and Cable’s leadership of the group is becoming more apparent and causes a lot of discord. As the cover shows, Sunspot leaves the group at the end of the issue. After being informed that his estranged father was murdered, Sunspot is returning to Brazil and Cable is mostly apathetic to this. That sets up a yelling match between Cable and Cannonball about the direction of the team. Cable sees the New Mutants as soldiers he has to train and develop for an upcoming war, with little regard for the people themselves. Cannonball gets even more upset, when Cable has the same reaction to the news to Rictor’s leaving. You really get the feeling that there is a huge changing of the guard, both in the make up of the team and in the group’s philosophy. Out of the remaining members you have Cable and Domino, both of whom share this bleaker outlook. Even Boom Boom is buying in on their more hard line approach. And then there is Cannonball, who is begrudgingly hanging on to this group he helped start in the first place. With Rictor and Sunspot out, the team will need new members. This issue conveniently provides them. Warpath has returned; the Apache reservation he lived on was seemingly destroyed by the Hellfire Club and he wants revenge. Cable promises he will assist in that as long as he’s dedicated to fighting the war to save mutantkind. On the brightside, this issue is the debut of the cat-powered Feral, who is looking for protection from the Morlocks, and the end features a yet-to-be-revealed Shatterstar popping up in the Danger Room. This might be one of the most depressing comics I’ve ever read. You wouldn’t know that from the cover that it would be about overcoming feelings of loss. 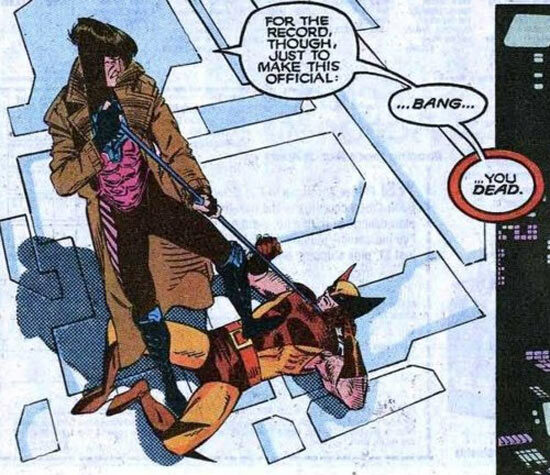 This takes place during the X-Men crossover Fall of the Mutants. The team is back at the X-Mansion dealing with the recent death of Cypher, which was admittedly their fault. The group had went out on their own, defying the orders of Magneto. At that point, he had been serving as their mentor as Professor X had vanished. There’s a lot of name calling and crying among the group about what had happen. This feeling of grief is only escalated, as they find out that the X-Men are seemingly dead, which Magik takes really hard since among the casualties are her brother Colossus. Before anyone can completely process what this news, Magneto returns and is irate about Cypher’s death. The rest of the issue is devoted to the characters trying to resolve these feelings about what had happened. Magneto is struggling with the fact that the New Mutants feel no connection to him as their leader. The New Mutants struggle about their role of being teenagers thrust into a really adult situation, having the heavy burden of protecting the world and working to achieve Charles Xavier’s dream of a safer society for man and mutant alike. Unfortunately for them, they have to accept that responsibility, and Magneto has no jurisdiction on that. This is one of Louise Simonson’s most shining moments as a writer. Each character, from Magneto to Wolfsbane to Magik all are able to express a distinct set of emotions on Cypher’s passing without any rehashing. It’s a great example of how super hero comics can tell a compelling story without having any action whatsoever. Who misses Marvel’s summer annuals? I’ll give you a hint: this guy does. New Mutants Annual #7 bridges the gap of the team’s transition from being the New Mutants to X-Force. And it sports this cool Mike Mignola cover. The main feature sets up a crossover with the New Warriors, and there is another serialized story about the evil mutants turned government operatives in Freedom Force. But the best part of this is the last short story by writer Judy Bogdanove and artist Jon Bogdanove (I’m assuming they are married). 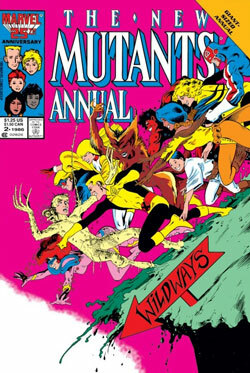 It features the young mutants Artie, Leech and Wiz from the X-Terminators going on an adventure of their own and unintentionally causing a ruckus as they fly around town in a flying saucer. It ends with them finding a new friend in a grandmotherly old woman. The whole scene is really touching with Leech mistaking her for his deceased mother. That said, the story is a lot of fun and really is the highlight of the annual. It reminds me of something out of Spielberg’s Amazing Stories television series. Since it is an annual, there is also the obligatory pin up pages (by Rob Liefeld and Art Thibert) and a pretty cool organizational chart of the team which you can view here. 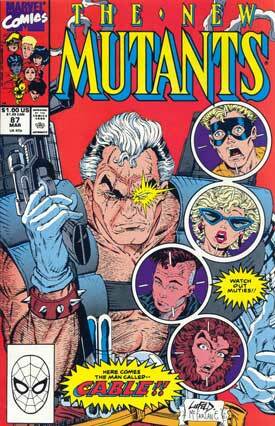 New Mutants #87 introduces Cable to the Marvel Universe. It’s not every month a character who is going to have this big an impact on the series debuts every month. Not only did Cable debut in this issue but his primary nemesis Stryfe does as well. 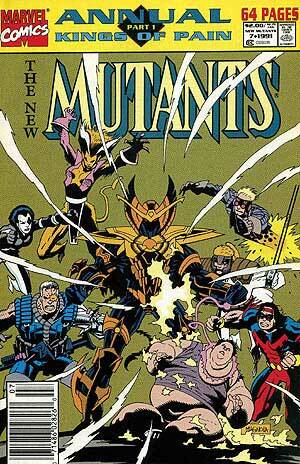 Stryfe is part of a group of terrorist mutants called the Mutant Liberation Front. They’re attempting to rescue the incarcerated New Mutants Rusty and Skids. And by rescue, I mean wind up brainwashing them into joining their ranks. As this is going on, Cable shows up in an attempt to stop Stryfe from abducting the duo. The book ends with the MLF escaping and Cable being locked up by the government, as he was blamed for the attack. What this issue did was set up the last year of the series, as well as it’s relaunch/metamorphosis into X-Force. In the issue, it wasn’t very clear why Cable needed to protect Rusty, Skids or the rest of the New Mutants, but it was established that there was some reason he would not accept them joining Stryfe’s forces. There’s a lot of mystery about what is going on and it does get explained in later issues. Uncanny X-Men #273 has the incredibly fitting tagline “Too Many Mutants! or Whose House is This Anyway?”. This issue has the three battle weary X-teams–X-Men, X-Factor and New Mutants–recovering from the events of the X-Tinction Agenda storyline at a battle ravaged X-Mansion. 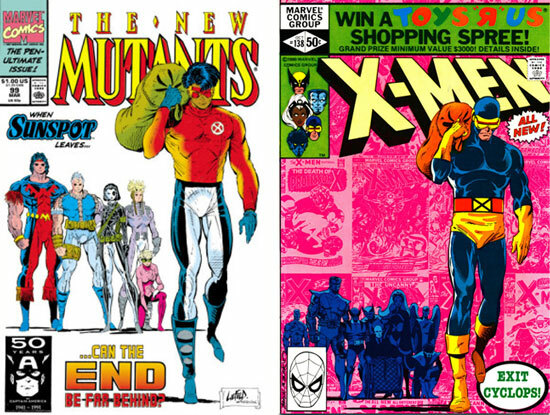 Remember when there were ONLY three X-books? Anyway, this is pretty much a Storm issue with her deciding what the future of the X-Men will be. Cable urges her to take a more proactive stance and preemptively strike threats to mutant and mankind. Jean Grey and Cyclops disagree with his plan. The conversation ends with Cable pretty much saying that he’s claiming the X-Mansion as his base of operation and that Storm has to decide whether she stays and shares his vision, or moves the X-Men in with X-Factor. Storm mulls the decision for the rest of the issue, only for the X-Men to be teleported out to the Shi’ Ar empire to save the long missing Professor X! Along the way, there’s some fun scenes like the pictured Gambit/Wolverine battle in the Danger Room (where our favorite Cajun mutant wins by some awesome cheating), and Iceman and Boom Boom constantly bickering for comic relief. Where Rogue was (which gets revealed soon after) and the whereabouts of Dazzler and Longshot (which gets told in the Shattershot storyline in the following summer’s X-book annuals). Rick Leonardi, Whilce Portacio, Marc Silvestri and Larry Stroman together. You read that right; this book had eight different pencillers. 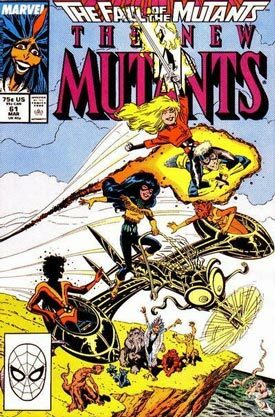 New Mutants Annual #2–Why Do We Do These Things We Do? It’s kind of easy to see how Cypher wound up on the short end of the stick in New Mutants. Everyone else has some sort of cool power, but he gets saddle with the mutant ability to speak and communicate in any language. Like that’s going to help pick up chicks. New Mutants Annual #2 is Cypher’s time to shine. This annual is a fun story by Chris Claremont and Alan Davis which has some historical significance, as it’s the first appearance of telepath-turned-martial arts expert Psylocke in the Marvel Universe. Technically, she had been around for a while in the Marvel UK Captain Britain comics but this was her proper introduction. So how does Cypher–along with his best friend, the technarcic Warlock wind up saving the day? The plot was a little confusing, so bare with me. In short, Mojo has kidnapped Psylocke in order to use here telepathic abilities in an effort to take over the planet. After failing to rescue his sister, Captain Britain is de-aged. The New Mutants are incapacitated. It’s up to Cypher to free Pyslocke. Claremont does a good job of making the character likable as he grows in confidence through the story. The friendship between Cypher and Warlock is very natural, so its only appropriate that the two literally merge to stop Mojo. There was a bit of an odd plotline towards the end of the story, with Psylocke being awkwardly flirty towards her teenaged savior. Talk about a power couple! 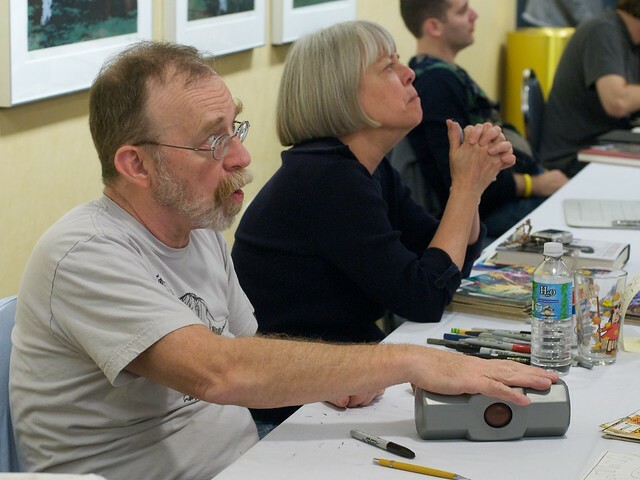 Louise and Walt Simonson are two of my favorite comics creators. Whether working independently or as a team, any book that they get a credit on is a must buy for me. I could go on for days talking about their work, but lets just visit some of their more well known projects. As a writer, Louise had lengthy runs on Power Pack (which she created with June Brigman who went on to the Brenda Starr comic strip) and New Mutants, two of my favorite series from Marvel. Over at DC, she was a big part of the 1990s Superman line, writing Superman: Man of Steel and later created Steel with Jon Bogdanove during the “Death of Superman” era. Louise has also crossed over from the comics spinner to the bookstore shelf, having written several novels and young adult books featuring DC super heroes as well as DC Comics Covergirls, a coffee table book featuring the history of the publisher’s lady characters. Walt made a huge splash on the comics scene with his Manhunter backup feature in DC’s Detective Comics. He went on to his now legendary run on Marvel’s Thor, where he was the writer and artist. This really is some of the best Thor stories ever; this period brought us Beta Ray Bill. He also had a similarly successful run as writer and artist on Fantastic Four. Walt has also worked on a bunch of projects for DC, including Orion, New Gods and Hawkgirl. Together, Louise and Walt had an extended run on X-Factor, where they turned poor Angel into the super awesome Archangel. They also wrote the critically acclaimed Meltdown limited series; a surreal adventure featuring Havok and Wolverine, with art by painters Kent Williams and Jon Jay Muth. Recently they’ve collaborated on a series about the video game World of Warcraft for DC/Wildstorm. Their legendary careers aside, the Simonsons are super nice and friendly when meeting fans at comic shows. They’ll happily sign anything and love talking about comics.